Because January's no-spend was such a positive experience for me, I decided to keep it up for the month of February. I've been in the process of slowly revamping my collection (new bases, new brushes, etc), so I knew I wanted to continue that theme for this month's purchases. I stuck to three staples that have been on my radar for a while now - a Charlotte Tilbury blush, the MUFE bronzer, and a super illuminating primer in the form of Becca's Backlight Filter. So far I've been SO pleased with these items (even though I've only had them a few day) - to the point you're probably already tired of seeing them on my Instagram. Charlotte Tilbury Cheek to Chic Blush 'First Love' : I've been wanting to try a CT blush for ages now and finally snagged one. First Love is medium neutral blush with warm, peachy-brown undertones. The exterior shade is a lighter peachy-beige that has a shimmer running through it. The interior shade is a more muted, rose shade that is primarily matte. The idea is to apply the exterior shade first and then go in to add a bit more pop of color using the interior shade. I tend to swirl my brush through each and then apply them together. The duo is a nice warm neutral and doesn't feel muddy on the skin (which some neutral blushes can). The texture is finely milled and super silky; it is also highly pigmented - so apply with caution! 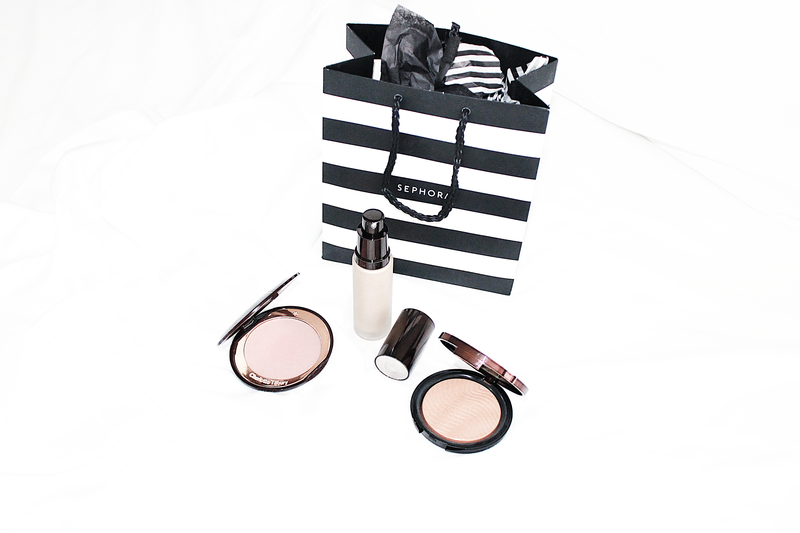 Becca Backlight Priming Filter : Holy yes. I had been lusting after it for a while, and after swatching it again in Sephora (and seeing it was the last one on the shelf) I knew it was coming home with me. This primer is hydrating, intensely glowing, and fills in lines nicely to create a smooth base. The glow in this is super intense, so if you are someone who doesn't like an intense glow/dewy look I would say this one isn't for you. However, if you are someone like me who wants to glow like there's no tomorrow - you'll love it! Make Up For Ever Pro Bronze Fusion Bronzer '25I' : This was 100% a Jaclyn Hill influenced purchase and one that I had been thinking about since VIB sale. I snagged 25I (it was also the last one on the shelf so I took it as a sign) and love it. This bronzer is not super pigmented - which I love. This means that there is no "oops, now I look like an oopma-loopma moment". It builds beautifully and the finish is flawless and glowing. Do you own any of these products? What items have you purchased during the month of February that you love? Let's chat in the comments below!